Studied at the University of East Anglia, U.K. from 1986 to 1989 (BA (Hons) Economics and Quantitative Methods); Clayton University, U.S.A. (Masters in Business Administration). Professional Memberships: Associate Member of the Chartered Institute of Insurance / Chartered Insurance Practitioner; Fellow Member of the Institute of Chartered Shipbrokers; Associate Member of the Chartered Institute of Arbitrators; Member of the Chartered Institute of Transport. 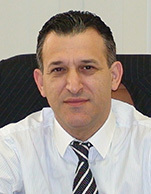 Mr. Ioannides has over 26 years of experience in the insurance sector relating to marine and non-marine, including captive management and has been CEO / Managing Director of Marsh Brokers Ltd., Cyprus Branch since 1999 (previously named HSBC Insurance Brokers Ltd.).